A few years ago, Mary and John gave me a panini maker with a great cookbook. 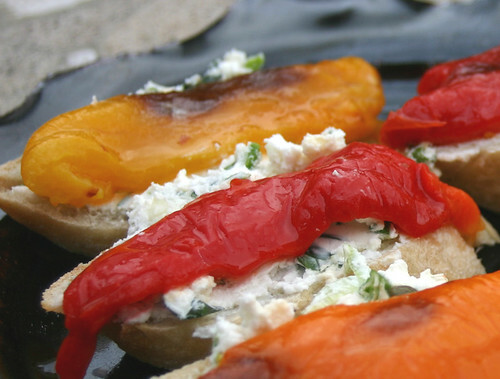 I adapted one of the sandwich recipes into a crowd-pleasing and mighty pretty appetizer. The cookbook is Viana La Place Panini, Bruschetta, Crostini Sandwiches, Italian Style (pithy). I’ve served this at many dinner parties, and it’s always a big hit. I usually double or triple the recipe adding only 1.5x the oil, capers and lemon juice. Place the goat cheese in a bowl and combine with the green onions, herbs and garlic. Season with salt and pepper. Set aside. You can prepare the cheese mixture several hours in advance (I usually do this the night before the party). Refrigerate then bring to room temperature before using. Love this sandwich! Looks perfect for this hot weather. YUMM!!! I love goat cheese anything!